With my 4th year of medical school underway, I knew the second part of boards was quickly approaching. In order to prepare for this test, I decided to hide out. I found myself living with my brother and his wife in Dayton, Ohio... a city not known for their food scene. While here, I considered putting my blog on hold for the month, but I eventually realized I wouldn't keep my sanity if I did so. Anyway, I decided to lump together all the different restaurants I tried while in Dayton, Ohio into three blog posts. There is no particular order... just a quick description of what I really enjoyed and what I will never eat again. The first post includes mostly chain restaurants, but these are ones not available in the Chicagoland area. In fact, some of these I had never heard of prior to arriving in Ohio. Enjoy! Before arriving in Dayton, I had heard about Skyline Chili and seen the ridiculous pictures of cheese topping their spaghetti. So I had placed Skyline high on my list of restaurants to try. There were too many options so I ended up ordering a couple of the smaller sized dishes to try. First was the three-way, which was their classic spaghetti topped with their famous sauce, beans, onions, and of course that mound of cheese. I also tried a cheese coney... basically a hot dog covered with the chili and, this time, I chose habanero shredded cheese. All I can say is the first bite or two is delicious, but it gets old real fast. Also, the smell is just a little strange for my liking. I enjoyed the coney more than the spaghetti, but it still wasn't enough to make me want to come back. Maybe it was too much cheese, but I felt real sick after eating here. Also, the raw onion is just way too much. They need to lighten up on their overgenerous hands with toppings. It was the 4th of July when I was essentially forced to eat at Penn Station. My brother and I drove around to several restaurants... unfortunately, every one was closed. Finally, we decided on Penn Station, a restaurant that features East Coast subs. I still don't fully understand what that means, but after trying the toasted subs, I was hooked. I had the chicken parmesan sub, while my brother stuck with the philly steak. Both are generously filled with meat and veggies. The best value is one the second largest sub sandwich. The bread is buttered and toasted till a nice crust forms. I would share a large fries between two people. Make sure you request for additional vegetables... there is no extra cost so add whatever you like! Overall though, the sandwich combinations are limited. I wished for a more extensive menu, and a little more flavor to the sandwiches. Everything was surely under seasoned. Dessert time! The best ice cream in the area belongs to Graeter's. With dozens of locations, it was always within a mile of wherever I was at... this was dangerous. 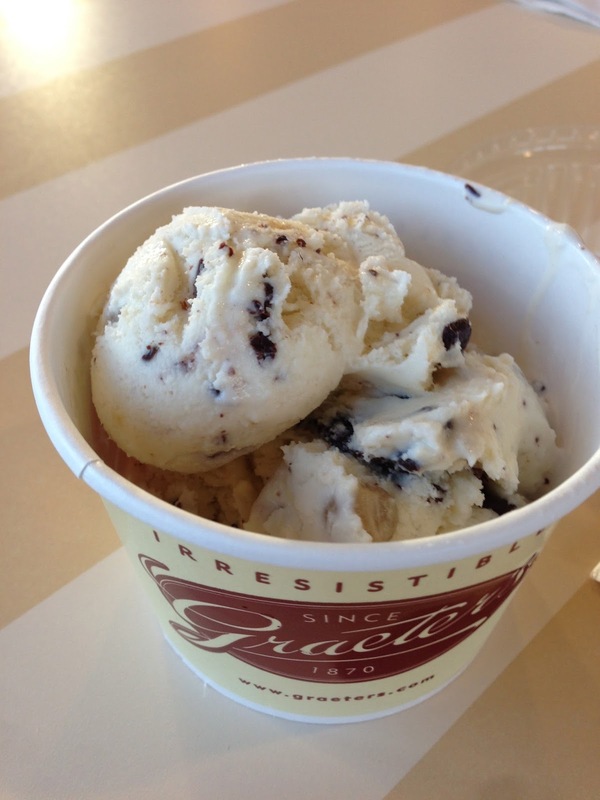 Graeter's is known for the "chip" flavor ice cream. But rather than having the typical small chocolate chips present, it was more like a rough chop of a huge chocolate bar that added the "chip" to each flavor. From chocolate coconut almond chip to peanut butter chip to even black raspberry chip, Graeter's had flavors that would make anyone's sweet tooth happy. 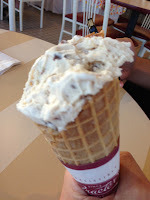 The ice cream is extremely rich and the cones add the crunchy texture that I love. The prices are very reasonable especially for the amount of ice cream they give you. 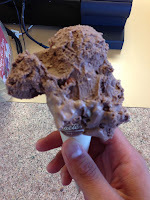 Now that I am back in Chicago, I still crave Graeter's. I still remember when my family found out that the Schlotzky's Deli in Decatur closed. We were all disappointed because where else would we find that focaccia-like style bread, and for me, where would I get the BBQ chicken pizza that I craved. As soon as I arrived in Dayton, my brother told me schlotzky's still had an open location here. It was high on my priority and after ordering a Grilled Chicken & Pesto pizza and the Fiesta Chicken Sandwich, I knew I made the right decision to come here early in my stay. The bread was just as I remembered... soft in the middle, crispy and buttery on the exterior. It soaks up all the different sauces and juices from the ingredients placed inside. Definitely order the medium sized sandwich. It is significantly larger than the small and only a buck or two more. The sandwiches are all made to order so it may take a few more minutes, but definitely worth the wait! As a child, I remember stopping at Tim Horton's on our way to Niagara Falls. And I remember being able to order a sandwich and then choosing a doughnut for my side. This concept intrigued me and I had to come back to see if this was still an option. And, it was. Here, I ordered a buffalo chicken panini and was able to have the sour cream old fashioned cake doughnut as my side dish. Unfortunately, everything about this meal was awful. The sandwich was essentially microwaved, making the bread soggy. The buffalo sauce was not spicy, and in fact, tasted a little sour. The doughnut itself was old... making it less cake-like and more of a stale, dense piece of bread. Never again will I come back to Tim Horton's. The price is not worth the food you get. At least they have decent coffee.